ENSIFERUM Launches New Video For "Way Of The Warrior"
On September 15th, ENSIFERUM will release their seventh full-length, Two Paths, worldwide via Metal Blade Records. Produced by Anssi Kippo, the master was recorded on tape, for a true analog experience. ENSIFERUM has now launched a video clip for the 2nd single "Way Of The Warrior", which can be viewed on KNAC.COM HERE. ENSIFERUM comments: "Hi folks! So here it is, our brand new video of the song "Way Of The Warrior". Like our music combines metal and folk elements so does this video. It was really great to be involved in the process more than we ever have been before and the result turned out to be fantastic! We hope you enjoy it as much as we enjoyed recording the song and shooting the video. So turn the volume up to eleven, move your furniture a bit so that you have room for moshing and press play!" You can't talk about the true greats of folk-inspired melodic death metal without reverent mention of ENSIFERUM, and with Two Paths they once more affirm their place in the pantheons of the genre. Further building upon the thrilling metallic hybrid honed across six full-lengths, Two Paths is simultaneously the Finnish quintet's most epic and far-reaching collection and their most organic, which definitely sets it apart from the pack. Additionally, the album literally takes the concept of Two Paths to heart, with two different versions of standout tracks "Don't You Say" and "God Is Dead". 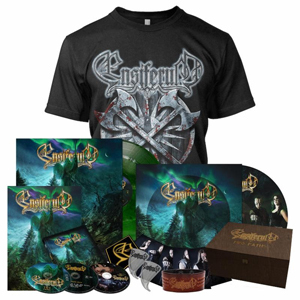 "Even though ENSIFERUM has always had clean vocals and choirs, harsh vocals have been the main style, and those songs worked so well with both styles that we decided to include both versions," explains bassist/vocalist Sami Hinkka. With Mikko P. Mustonen again handling orchestral arrangements and Lassi Logren returning to play nyckelharpa and violin on a few songs, Hinkka is also more than happy that they brought "more bombastic orchestral and down to earth folk aspects" to the record, further fleshing out their vision. This also applies to the contribution of Gyula Havancsak, who provided the artwork for both Two Paths and its predecessor, One Man Army. "It was really nice to work with him again because he always wants to hear our ideas and then he adds his own magic and improvements to them, and the result is always astonishing." "For Those About To Fight For Metal"